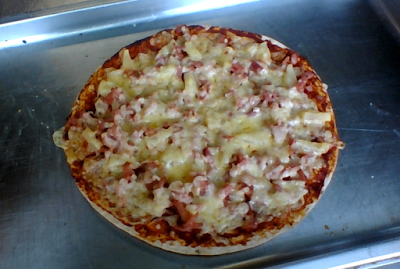 First day of cooking class for yr 8's going to tech today we were making pizza at tech. The topping was tomato paste with pineapple and ham and cheese on top. But before we were making pizza we had to find a buddy to bake and work with my buddy was Samoa.Once we had to find a buddy we had to learn about how to make pizza but our cooking teacher Ms Hake told us we are going to learn how to make pizza but not just that we are going to learn about vegetarian people and how they get lots of vegetarian and not that much meat like us but they get vegetarian meat same but a bit different to us .